New name, new town, new life. Nastasya has done it too often to count. And there’s no end in sight. Nothing ever really ends... when you’re immortal. But this time is different: Nastasya knows that this new town must hold her salvation—or her death. Nastasya was born into darkness, and has embraced it her whole life. Four hundred years ago, a tragedy robbed her of her birthright, and she’s been living a lie ever since. Now, four centuries of exploring the depths and limits of dark power has left Nastasya feeling sickened unto death. If she continues down this road, she will end up as a very dark, twisted, evil thing—with unthinkable power. Or she can begin the long, painful road toward light, and reclaim the destiny that others tried to destroy. They’re rare. You may have never met one, never sat next to one on a plane, never eaten in the same restaurant at the same time. But the Immortals are there. Have always been there. Will always be there. Moving among humans, playing out their own cursed fate. Sometimes subtly, sometimes with huge, sweeping implications for mankind. But no one will ever know. Except you. Natasya is immortal. Having lived over 400 years, she believes that she has pretty much seen and done everything. In her current life, Natasya lives for the thrill. The thrill of the next party… the next drink. Sadly, her life holds no true joy. Just the attempt to mask her dark feelings. On one esspecially dark night, her companion for the last 100 years begins to show his true colors. Frightened by what she sees in him and herself, she decides to check herself into "immortal rehab." And what she finds there is more frightening than anything she had imagined. Immortal Beloved is quite a surprising read. Tiernan deeply impressed me with her ability to take me from disliking a character deeply to rooting for her. For Natasya, this whole novel is about growth. Both personal and emotional. In the beginning of the novel, Natasya has rightly earned her nickname, Nasty. She is basically that. An immortal who cares only for her own pleasure. But all this changes when she begins to fully see the darkness in herself. But it is not until about half way into the novel, her character really begins to make the turn around. Is she a perfect character? Not in the least. But I loved that she recognizes that things need to change and is willing to put in the effort. 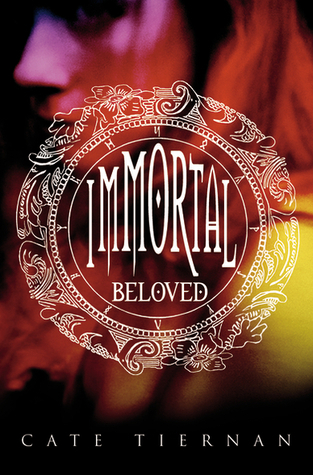 With paranormal this or immortal that running rampant in YA novels currently, Immortal Beloved stands out for its beautiful writing and moral lessons that stick with readers long after the first page. Immortal Beloved is essentially about the battle between darkness and light. And the choices that we must make in order to be true to ourselves. A fantastic beginning to this series. Oooh, color me intrigued. I love books/tv shows about immortals. I think it would be so horrible.